The Gold Edition of Bridal Couture Week will be choreographed by ace choreographer Ketan Bhatia from New Delhi, India. 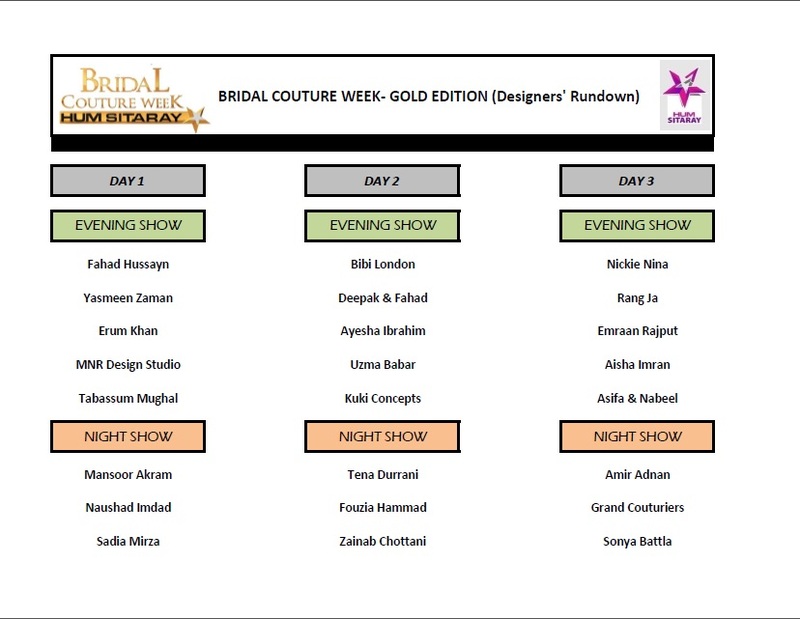 The designer line up and long list of showstoppers make BCW Gold Edition the most eagerly awaited bridal fashion extravaganza of the season. The Gold Edition of BCW will also present Bibi London featuring Neeta Lulla and Tarun Tahiliani’s latest collections and the Grand Couturiers segment will feature prominent names of our industry including Umer Sayeed, Shamaeel Ansari, House of Kamiar Rokni, Elan, Sania Maskatiya, Zarah Shahjahan, Nida Azwer and Shehrzad Rehmatoola. The designer line-up includes Amir Adnan, Aisha Imran, Asifa & Nabeel, Amina Yasmeen by Mansoor Akram, Ayesha Ibrahim, Deepak & Fahad, Emran Rajput, Fahad Hussayn, Goal by Fouzia Hammad, Hamna Aamir, Kuki Concepts, MNR Design Studio, Naushad Imdad, Nickie Nina, Rang Ja, Sadia Mirza, Sonya Batla, Tabassum Mughal, Tena Durrani, Umsha by Uzma Babar, Yasmeen Zaman and Zainab Chottani. N-Pro and N-Gents will be grooming 58 male and female models over the course of three days along with a long list of showstoppers to walk the ramp this season. #BCWGold will also present 4 international models to walk the ramp this year.